The fastest pint-sized race walker on the West Coast -- and now, nationally, yet again -- knows a thing or two about competing. 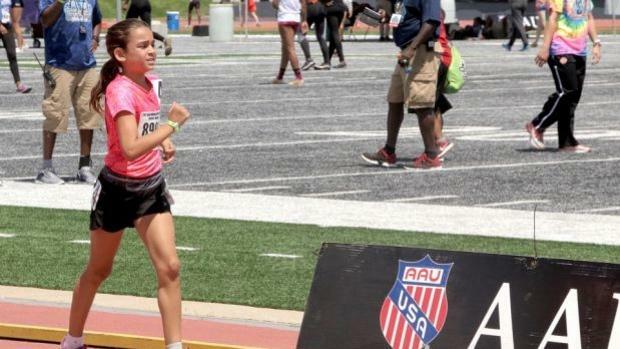 Reese Gentry scored her second straight AAU Junior Olympic Games championship in the 1500m race walk on Saturday on the first day of the Games, narrowly missing out on a national record by just two seconds with a finishing time of 7:19.29. The Northridge (California) resident beat second-place Sophia Rankin by over a minute (8:32.34), and outpaced the Race Walk Princess of the Bronx (New York), sixth-place finisher Tiarra Jackson, by over two minutes. Had Gentry recorded a national record, it would have been her second straight. 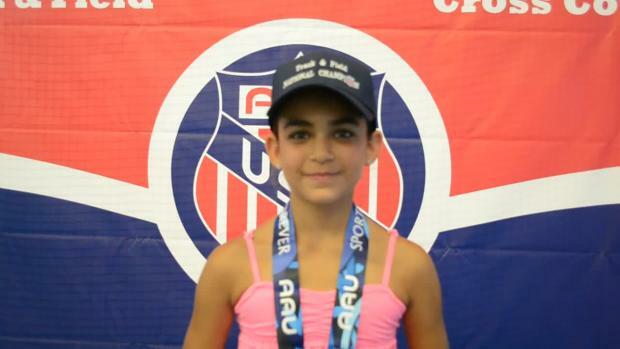 A year ago, she posted a time of 7:46.29 in the 10-year-old division. Get this: all she could think about afterward was technique. "It's a really fast cadence and it's really hard to keep up," she said of the event. "So you have to always think of your fast cadence and your hands and whether you're lifting or if you're going too hard. It's a challenge." But Gentry has experience, too. She practices with her dad on weekdays in the neighborhood; he jogs while she perfects her racewalk form. "It's fun bonding and it's really, really nice," she said. She even competes with her brother, Cole, who's three years older. When she goes out to events -- Cole's at home for this one, she says -- she uses him as motivation. "[His time] was my goal," she said. "I used to look up to him, but now I'm training with him." As for the question of who's faster? "We usually tie," she says, "but sometimes I go faster." If Saturday was any indication, Gentry is in store for much more success down the road. She's still 11. And while she likes breaking records, it's not such a big deal, either. "[Breaking a record] is a goal every single time," she said. "But sometimes it doesn't matter. It just matters if you try your hardest."